Victoria’s first Public Oral Health Care Awards started in 2010. The awards were established to mark the 120th anniversary of The Royal Dental Hospital of Melbourne - the beginning of public dentistry in Victoria - and to pay tribute to the often unacknowledged work being done by public oral health care professionals. The nominees were judged on the basis of their (1) contribution to the delivery of high-quality public oral health services in Victoria, (2) their contribution to improving the capacity of Victoria’s public oral health workforce, and (3) whether they had gone above and beyond what is expected of someone in their role. The winners received a trophy and $5,000 funding to attend a health conference of their choice, presented to them at the DHSV Annual General Meeting. Professor Calache has devoted his career to improving dental care for Victoria’s most vulnerable and to increasing the efficiency of the public dental workforce. Prof Calache spent nearly 20 years as a public dental officer before moving into education, research and management roles. He is recognised as being instrumental in expanding the education and role of oral and dental therapists in Victoria, and of driving improvements in the quality of clinical care provided to children, elderly people and people with disabilities. Conducting research into the capacity of oral and dental therapists to treat adult patients, and developing an education program to extend the scope of practice for qualified therapists. Contributing to the establishment of the first dental hygiene and dental therapy education programs within a university dental school in Australia, and then the transition of these courses from a diploma to a degree. Helping to establish the Bachelor of Oral Health program at La Trobe University Bendigo. Developing and implementing education courses to improve the capacity of oral health practitioners to treat pre-school children, adolescents and patients with special needs, rather than referring them for treatment under general anaesthetic.Working to implement a minimum intervention dentistry approach in the public dental sector. Prof Calache is described by colleagues as a quietly persistent and passionate advocate who continues to work towards lasting reforms in the public oral health care sector. Dr Koshy has made an outstanding contribution to improving access to public dental services in Victoria, particularly in regional areas. As well as contributing his skills in specialist endodontic care at The Royal Dental Hospital of Melbourne, Dr Koshy has worked with public dental clinics in Boort, Bairnsdale, Orbost, Mallacoota, Maryborough, Sale, Plenty Valley and with the Victorian Aboriginal Health Service to recruit, mentor and retain dentists in areas which previously had minimal or no public dental service. Dr Koshy has shown leadership, commitment and resourcefulness in developing and executing a successful clinical training program for overseas trained dentists and in providing support and coaching to new dentists so that they can bring high-quality clinical skills to rural areas. 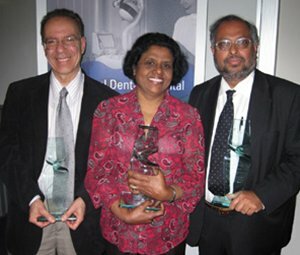 Dr Koshy has also found innovative ways of meeting the demands of regional communities by increasing dental chair utilisation, reducing waiting times, and improving access for disadvantaged groups in the community including survivors of torture, Aboriginal people, bushfire-affected patients and disadvantaged children. According to his colleagues, Dr Koshy makes himself available 24 hours a day to clinical and management teams, and works weekends and travels long distances to see patients and visit rural clinics. He also volunteers his time as a clinical accreditation surveyor for the Australian Council on Health Care Standards and serves on committees of the Australian Dental Association Victorian Branch. Dr Koshy’s extraordinary dedication has resulted in important improvements for Victoria’s public dental patients. Over 45 years Ms Dias has provided an exceptional level of care to patients and demonstrated outstanding professionalism in assisting in the delivery of quality oral health care in a wide range of public health settings. Ms Dias began her career as a dental assistant on board a United States hospital ship. She went on to work with Vietnamese refugees in Hong Kong and then became one of the team who set up the Western Region Health Centre dental clinic. While in this role she visited supported residential services that accommodate marginalised and homeless members of the community, and showed patience and understanding when assisting with the provision of dental treatment to people treated through the Victorian Foundation for Survivors of Torture. Ms Dias spent two years as the only dental assistant in the dental clinic at Kew Residential Services which serviced more than 400 residents with physical and intellectual disabilities. While in this role she conducted oral hygiene education sessions for residents’ carers and reduced patient recall times. For the past six years Ms Dias has worked in the undergraduate clinic at The Royal Dental Hospital of Melbourne where she gives high quality assistance to dental students and their patients. She assists with Australian Dental Council examinations, provides training and guidance to trainee dental assistants, and participates in research and evaluation projects. At her own expense she travelled to Chile in 1998 to address 100 dental assistants on chair-side cross-infection control. Ms Dias is described by colleagues as someone who leads by example in the delivery of person-centred care and who nurtures these values and skills in Victoria’s future dental professionals. For the skills, advocacy and resourcefulness she has displayed in establishing and growing community-based dental services, particularly for disadvantaged groups. For the energy, commitment and excellent role model he has provided to young oral health professionals and students considering a career in the rural public dental sector.